You have an IDEA. How do you transform that Idea into a product that you can market and sell? How do you make the hardware? Create a schematic symbol and capture the design? What is PCB layout, and why do I need a Gerber file? Can I simulate the design before I build it? How long does it take to design a simple board? How much does it cost to fabricate a PCB? How much to assemble it with the components? The flowchart below shows the basic stages an Idea goes through to becoming a tangible reality. In this article, we focus on the Hardware part of product development. Please refer to the other articles in this series for explanations of Software, User Application and Testing. The Hardware block is expanded below for easier reference. This is a high-level diagram of the basic flow to create electronics; The nearly a dozen stages indicated in the diagram could have multiple sub-stages, depending on the design complexity and requirements. To illustrate this process, we’ll use the Idea of a smart garage door opener. The idea is that a homeowner wants to use a smart-phone to check if the home garage door is opened or closed. The homeowner would also like to be able to remotely open or close the door with the smart-phone. For example, to let a guest in or a child that forgot/lost a key. Referring back to the flow chart diagram at the beginning of this article, the Idea needs to be conceptualized so that it can be shared with everyone that will be working on it. The Concept set out what the idea is, what it does, who will use it and in what context. Even if it’s just you, it still important to write out and document the Concept so you can focus on specifics. This is the starting point for the requirements of the idea. The Concept is very similar to the idea, but with added details and refinement: A garage door opener that is powered with standard US 120V, 10A circuit. It should have a wired push-button to open/close manually, an integrated light fixture and safety sensor inputs (e.g., doesn’t close if something/someone is in the way). Should be able to handle single wide and double wide doors. It connects wirelessly with a smart-phone (Apple/iOs or Android, no Windows, Blackberry or Others). As this is a fairly generalized description, it shouldn’t take more than 1 hour to write out a Concept of a thought out Idea. Next is to do an Analysis or Feasibility study. This is where you investigate all the possible (and even the impossible) ways you can realize the idea. It’s best to partition the concept in various blocks or modules to make the analysis more cohesive. Some major blocks in this Concept for a smart garage door opener are Motor, Lighting, Power, Communications, Enclosure, Controls. It’s worth emphasizing that at this initial stage, all the various possibilities should be taken into account, researched and explored. Nothing should be dismissed. The Feasibility process is to document the findings, and then rank them; Pick the top candidate as the “recommendation” for going forward. Let’s dive into the Communications: Should the device have wired or wireless capabilities? There are many wireless communications methods available including Cellular, Radio, WiFi, WiMax, Bluetooth, Zigbee and others. Wired solutions could include standard Ethernet or Ethernet-Over-Powerline. Each of these should be examined to determine if it would meet the requirements, what are the advantages and disadvantages for each, the availability and cost. Other things for consideration may include the size, weight, power usage, and regulatory compliances. For a smaller, not too complicated product (and these metrics of course depend on your background, experience with similar products, and many other factors) budget about 45 hours for the Feasibility study. This may seem like a large up-front time investment, but being thorough at the beginning pays off huge dividends as the project progresses. The cost for making changes at this stage is also very low; The cost increases exponentially with each stage. As an example: Imagine the scenario where you launch the product – Yay! A happy homeowner buys your smart garage door opener and has just paid the installer to put it. The homeowner launches the smart-phone app but can’t “find” the garage door opener. After a long talk with your (expensive) help support tech, the problem is found out that opener is “too far away” to communicate. No longer a happy homeowner when it comes to your product (and you can be sure you’ll hear about it on Twitter, Facebook and Yelp). You have to take a return on the opener and reimburse the owner for the cost of the installation/removal. Expensive! And you find out that as more customers buy and install the open, more than half have the same problem. This means a recall and redesign. Which could have been avoided by a thorough and detailed investigation during the Feasibility stage. Having completed the Feasibility study and defined solid recommendations for how to meet the Concept requirements, the next phase involves defining the Hardware, Software and User Application. Let’s start with Hardware. This is the physical, tangible “thing” that you are going to produce. In the case of the smart garage door opener, there is a motor, gears, a metal case and a clear plastic light cover. A three-prong power cord plugs into an outlet and connects to the power supply inside the opener. Cables and wires connect all the printed circuit boards (PCB) together. Each board has chips, connectors, heat-sinks and other components. There are nuts, bolts, grommets and fasteners holding everything together. All of this is “hardware”. You can see some of this in the picture below. These items can be put into sub-groups under hardware: Board Specification, Mechanical Specification and System Specification. Now let’s look at each of these in a little more detail. The System Specification is where the “custom-off-the-shelf” (COTS) or “third-party” pieces are called out. In this case, the power supply (for converting the 120V AC from the house receptacle into 5V DC in the opener), the cable harnesses (connect the AC/DC power supply to each board), the gears, the screws and fasteners. From this specification, a System Bill Of Materials (BOM) is created which lists every unique item: a description of what it is, the vendor, the vendor part number, an optional internal part number and a placement designator. The BOM is used by the purchasing department to buy the necessary amount of materials to build the unit, and by the manufacturing group to know how to assemble it. For some products there literally no items that would be included in this specification, and for other products this is the only specification when they are built completely using COTS. I budget 15 hours on average for developing this specification. The Mechanical Specification defines the brackets, the metal case that houses everything, the clear plastic light cover, etc.. This specification provides the detail drawings of each piece with all dimensions, holes, hole diameters, bend lines and stamp areas. The designer uses a CAD (Computer Aided Design) program to create all the documents. The CAD files are used by the metal and plastic fabricators to create the housing. The specification can be created fairly easily as the bulk of the work is in the actual CAD file creation. Figure on 3 hours for the specification; but the CAD work can take from a few hours to many 10’s of hours depending on what is being designed. For a garage door housing and brackets, 10 hours should be sufficient. The CAD files are sent to the fabricator who cuts, bends, stamps, drills and otherwise works on the metal to create what is on the drawings. Similarly, a product may use a 3-D Printing (an additive process) or a CNC milling-machine (a subtractive process) to create pieces of the product. Rapid prototype companies can provide quick turn-around of low volumes in 1 to 3 days, but creating mechanical pieces can often take 1 to 3 weeks. The Board Specification, also referred to as the Hardware Specification, contains all of the information about the various modules, chips, resistors, capacitors, antennae, heat sinks and other electronics, interconnect and passive components on a board. If there are multiple boards in a design, then there would typically be a specification for each board. This specification has the basic characteristics and implementation details for each component, and is a very condensed summary of the data sheet. This document focuses on the electrical parameters and connectivity of the components. If you are not familiar with all the types of components available to you as a designer, there is a helpful 3-Volume Encyclopedia of Electronic Components that set includes key information on electronics parts for your projects—complete with photographs, schematics, and diagrams. You’ll learn what each one does, how it works, why it’s useful, and what variants exist. Of particular importance is the pin-out (e.g., what each pin or connection of a device actual does) for the components. Also included is the power usage and timing information. It’s also useful to include the device sizes (e.g., width, length, height and weight) for reference. How each device is used and how it connects with other devices on the board is described in this document. As such, the board specification is used as the guidelines for the schematics. This is a rather detailed document; It can take 40 hours to read through data sheets and determine how devices work together. In the case of our garage door opener example, how does the processor on the board control the motor to turn the gears which opens/closes the door? How does the door status get read from a sensor and sent to the communications chip? All of the signals travel on wires / board traces to the pins of chips and the designer has to determine which pins and wires are connected. For an illustrative example of what occurs in the next stages let’s look at the PIC24FJ16GA004 microcontroller from Microchip, and a USB Micro-B connector from Assmann WSW Components. The microcontroller is an “active” component, where as the USB connector is a “passive” component. With a comprehensive board specification and the relevant datasheets, a schematic can be created. The first step is to make a diagram or symbol for each component. These are also called “library elements”. This is a representation that shows the electrical connection for the device. This also has Power and Ground pins, which are often not shown on the schematic as these are common to many devices (the exception is when there are specific, non-common power and/or ground connections, often the case with communications or precision components). You’ll need some tools to get started at this stage. The “Eagle” tools from Cadsoft (a division of Autodesk) are excellent for beginners, hobbyists, entrepreneurs as well as full scale industry engineering firms. The software scales from simple designs to very complex ones. Another tool vendor to consider is Altium. Most of the vendors have fully functional free version that are typically limited by either the number of components, the number of schematic pages, the physical board dimensions, number of board layers or some combination of all of these. It’s also helpful to have a physical book to refer to as you are working with the these tools. The online materials available in .pdf format are extensive, but printing them can be costly and reading online can be straining. Many schematic tools vendors include the most often used components in a packaged library, and vendors also have symbol libraries for their devices. However, there are many different schematic tools, and many different components; It is often the case that schematic symbols for major components in the design will need to be created. Once all the symbols are available, the engineer can connect the pins together as required for the design. At this stage, all of the interconnects, passives, electromagnetic and active components for the design are accounted for on the schematic. The library for each of these contains a description, a vendor, a vendor part number and an optional internal part number. When a symbol is placed on the schematic, it is assigned a unique reference number which is used in the board assembly process. Once all of the parts are placed on the schematic, a parts Bill Of Materials (BOM) can be generated. This is used by the purchasing group to know how many of which item to buy. Also, once all of the components have been connected or “wired” together on the schematic, a “netlist” can be created. This is a file which lists the network of connections between the components on the board and is used in creating the physical layout of the board. This entire process is referred to the “Hardware Design” or “Schematic Capture”. For a small design with only a few components, budget about 15 hours for this step. Depending on the selected components and their functionality, it may be possible to simulate the operational characteristics of the design. Many manufacturers provide simulation models for their components, and it is also possible to develop models “in-house” (or pay a third-party developer to create them). A first level simulation may only use simple static timing analysis (STA) models and generate cycle-based results. This is generally a less computationally intensive method to validate and verify basic operations . For example, are address and data lines connected properly? Is combinatorial logic generating the expected output for a given input. At the other extreme, a fully simulated schematic will have parameters for all of the input buffer circuits, output driver circuits and internal times. It is also possible to enter wire or line delay estimated on the nets connecting the components. Since the nets are an abstraction of the physical wires and board traces, these are based on an understanding of how the actual board will be realized. In the Printed Circuit Board (PCB) Design, also called “Board Layout”, stage the engineer determines how the physical board will look with all of the components in place. Using another software tool (although usually from the same vendor as the schematic capture tools), the designer creates a 2-dimensional shape of a board (e.g., a 3 inch x 5 inch rectangle or 4.5 inch diameter circle) to represent the PCB. Similar to the schematic capture library, there must e PCB library element for each component. Whereas the schematic symbol was a conceptual representation of the electrical connections of the component, the PCB symbol is an exact physical representation (width, length, height). The layout symbol shows the solder areas for the pins and pads for surface-mount parts, as well as where the holes are for through-hole components. The PCB engineer places the components on the board and begins the process of placing metal traces to create the netlist connections indicated in the schematic. The “nets” in the schematic are virtual, abstracted connections, and the PCB connections are where the actual metal will be on the board. This is the stage where the ground (e.g., GND) and power (e.g., VCC or VDD) planes and connections are created. The “writing” for the part outlines, component numbering, company name / logo, product information, etc. is put into a “silk screen” on either/both the top and bottom sides of the PCB. 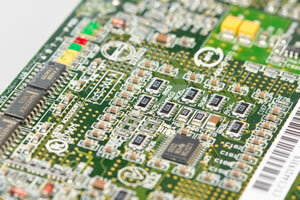 PCB design is both a science and an art, especially for analog designs and high speed designs. For a simple, low-frequency, digital design the PCB layout can take at least as long as the schematic capture stage. In this example, would budget about 15 hours. There are various design rule checks (DRC) which can be performed on the layout at this time. Many of these DRC relate to the PCB fabrication and Board Assembly – how closely parts can be placed together, what the minimum thickness is for a metal trace, the types of angles and curves permitted on metal traces, etc. Following these rules, and correcting any/all violations at this stage will help in the following stages. At a minimum, the physical connection netlist from the PCB layout should be compared to the netlist from the schematic capture. There should be a one-to-one correspondence between the two netlists. If they don’t match up, there is either a trace missing on the board, a trace added on the board or an incorrect trace routing on the board. Simulations can become more accurate at this stage since the connections between components is defined. The characteristics of the connections depend on such things as the length, width and amount of material (e.g., the copper pour) used in the trace; The number of connections between different layers of the PCB (e.g., the vias), the dielectric / type of PCB material (e.g., FR4) and other factors. It is also possible to simulate more than just the electrical signal characteristics of this virtual board. Heat maps and temperature profiles can be created; Electromagnetic interference (EMI) and electromagnetic radiation (EMR) – essentially how much “noise” does the system create at various frequencies – scans can be generated. At this point, the actual design process is complete. There are many places which will create the green (sometimes red) glass-reinforced epoxy laminate sheets that are the printed circuit board. A small, rectangular, 2-sided PCB can be produced very quickly for nominal cost. Many companies can quick-turn up to 10 PCBs in under 2 days for $25 to $50 each. With the components you ordered during the specification stage and the boards back from the fabricator, it’s time to “assemble” everything. Also called “stuffing” the board, this is where the parts are soldering to the board to create a finished product. Many designers will use the same company for fabrication and assembly. This can save on costs, since it’s a packaged price to include both services. And it can also save on time since there is no delay in mailing the PCB to you, and then you mailing the PCB plus components to the assembler. For reference, a small, 2-sided board with low number of components can be assembled in under 2 days for less than $50 per board. The cost drops significantly for a 1- to 2-week delivery. Per unit costs also decrease when ordered in volume, so the final production costs will considerably less than the initial prototype. Concept (1 Hour) – Result is a one-paragraph to one-page document. Analysis / Feasibility Study (45 Hours) – Result is a 20- to 50-page document. Hardware System Spec (15 Hours) – Result is a 1- to 10-page document and a Bill Of Materials (BOM). With these time estimates in mind, it’s possible for a solo-designer to go from an Idea to a prototype ready design in 3 to 4 weeks (at 40 hours / week). With a dedicated team, this can be expedited to under 2 weeks (!). What Idea do you want to start with? Share in the comments your favorite tools for Schematic Capture and for PCB Layout. Also, if please feel free to recommend any PCB fabrication and Board Assembly companies you would use for your next project.